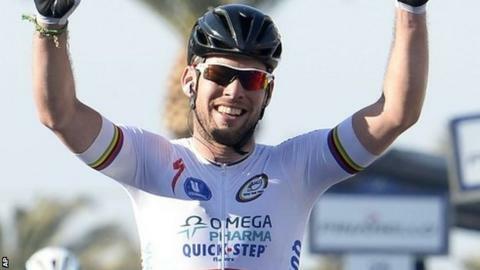 Mark Cavendish completed a hat-trick of stage wins at the Tour of Turkey, sprinting to victory on stage four. "I'm incredibly satisfied," said the 28-year-old Omega Pharma-Quick Step rider, who won the opening two stages. Maximiliano Richeze of the Lampre-Merida team finished second ahead of Cavendish's lead-out man Mark Renshaw. Estonia's Rein Taaramae leads the eight-stage event, maintaining his six-second advantage over Britain's Adam Yates, riding for Orica GreenEdge. Omega Pharma-Quick Step executed their plan brilliantly for team-mate Cavendish. They were among the peloton that caught Torku rider David de la Fuente, who attacked over the final climb of the 124km route between Fethiye and Marmaris, before stretching the pack in the final stages. Renshaw then stayed with Cavendish until the final 100m when the Manxman raced clear of both him and Argentine Richeze to win. 3. Mark Renshaw (Aus/OQS) ""
4. Kristian Sbaragli (Ita/MTN) ""
5. Elia Viviani (Ita/Canondale) ""
6. Jetse Bol (Ned/Belkin) ""
2. Adam Yates (GB/Orica GreenEdge) +6"
3. Romain Hardy (Fra/Cofidis) +38"
6. Adam Hansen (Aus/LTB) +43"